If you’ve been following this blog for any time, you might know that I’m a bit of a sucker for paintings. To be more specific, I’m a sucker for paint. I like work where the medium matters to how the finished work turns out (yes, I’m also one of those people who has a soft spot for Brutalist concrete buildings). Brendan Lyons is an artist I’ve followed on social media for a while, but this was the first time I’ve seen his work in the flesh. His own handout describes Viscous Songs most simply when it says are two kinds of work here. They first has a kind of trompe l’oeil intention, looking like something else – masking tape, bin liner. The tape effect works particularly well, leaving its own mark on a broken frame. They’re good at what they are – but what I really like is when it feels like the paint has taken on a life of its own. What had caught my eye about his art on Instagram was how it was almost sculptural, and this came across exactly as I’d hoped it would in real life. The paint moves away from its surfaces, seemingly following its own path. The impression is of an active moment caught frozen in time. There’s a lovely set of small copper plates which really feel like this: like the paint decided to play with what its limits of design were. 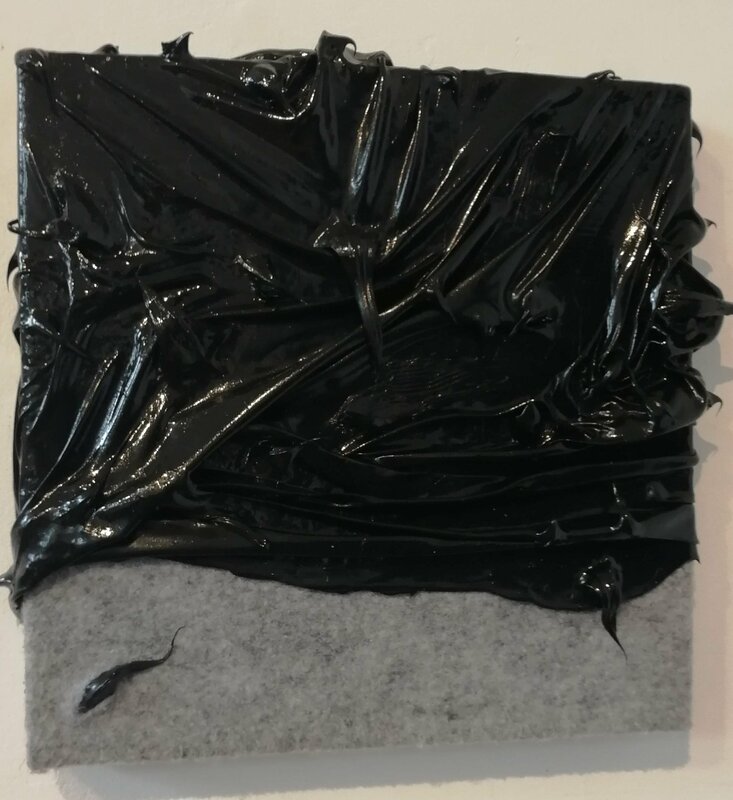 In another one I really liked (all his works are untitled), a felt surface appears to be being consumed by the inevitable force of black paint. I also found this felt piece particularly satisfying because of the contrast of materials, and this is another thing which works well with Lyons’ paintings. Every one of these paintings is so tactile: they feel as though they want to be further manipulated, squeezed, squashed into ever changing shapes. The play of the smooth and shiny black paint against the soft, fluffy felt works really well. It’s the star of the large piece which looks like a bin bag: you want to run a hand over it to feel the stretch. 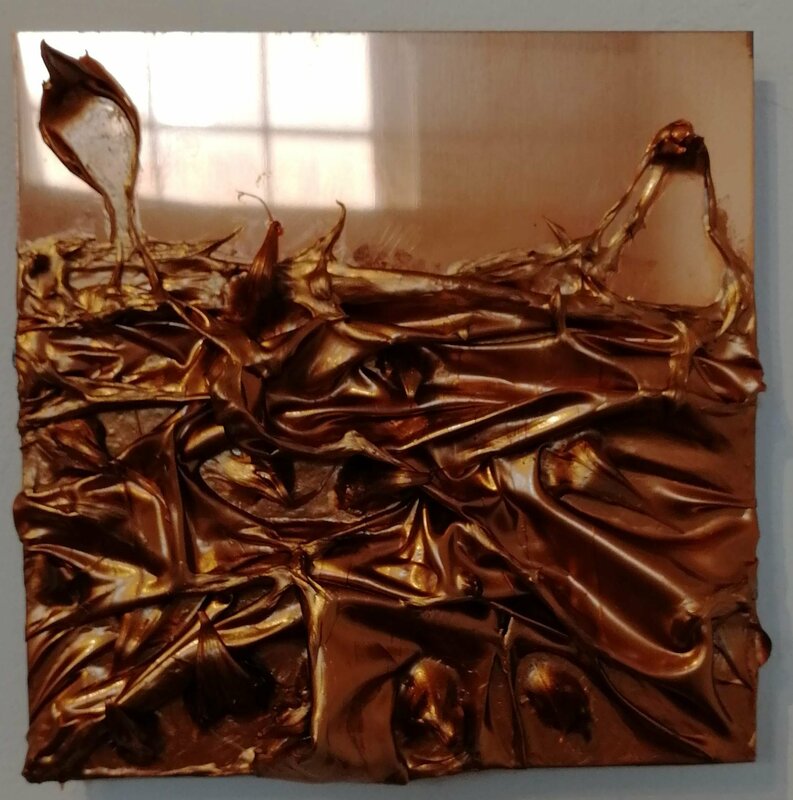 It’s also in two silver pieces where the surfaces parallel each other (see featured image), one pushing out into folds and crumples. It’s deeply satisfying. One my visit I was able to have a conversation with Lyons about his works. What was particularly interesting was how many of these works he described as experiments, as ideas he was still testing out and working on. This show is an exhibition of the cumulation of some ideas and processes, and simultaneously the start of an evolution. Lyons clearly has an instinct for how paints and surfaces can work together, and I’ll be staying tuned on Instagram for more insights into how these ideas evolve. This entry was posted in Exhibitions, Home, Past exhibitions and tagged art, Liverpool, painting. Bookmark the permalink.